The Harn Museum of Art at the University of Florida is an 112,800-square-foot-facility, which includes 40,400 square feet of exhibition space, 5 garden spaces, a 250-seat auditorium, study center, museum store, café and classroom spaces. The Harn’s collection totals more than 11,300 objects including African, Asian, modern and contemporary art, and photography with significant representations of Ancient American and oceanic art, as well as a growing collection of natural history works on paper. The Harn Museum of Art is a dynamic leader among public university art museums. The museum offers active engagement with the visual arts in a welcoming environment for diverse audiences. 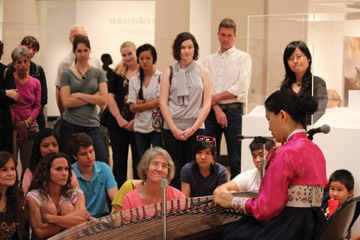 Through collaboration with University of Florida faculty and students, local partners and the international art community, the Harn provides relevant and engaging art-centered programming that reflects world cultures, human history and current events. 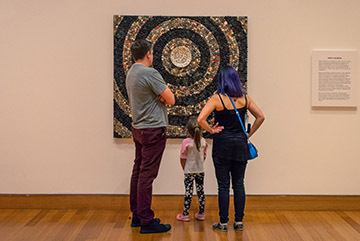 Exemplary collections and innovative exhibitions invite dialogue about regional, national and international issues, fostering critical thinking and sparking creativity. The Harn employs new technologies that reach wider audiences and enhance their encounters with great works of art. To harness the power of the arts to inspire and educate people and enrich their lives, we will expand and deepen strategic collaborations with partners at the University of Florida, the local and regional communities, and the international art community. To foster a sense of belonging and ownership of the museum among our audiences, we will welcome everyone to the museum and actively engage our expanded audiences in the development of experiences that positively impact their lives. To ignite new ways of thinking about ourselves and the world we will engage with creative thinkers to develop relevant and exciting permanent collection installations, temporary exhibitions and related learning opportunities. To enrich visitor’s experience of great works of art both inside the museum and beyond its walls, we will employ existing and new technologies to support all aspects of the museums work and achieve its mission and vision. The Harn Museum of Art is an integral part of the University of Florida. Since the museum opened September 22, 1990, it has served a wide and diverse audience with a broad range of programming, made easily accessible through free admission. The Harn Museum was named in honor of Samuel Peebles Harn (1893 - 1957), whose widow, three daughters and their husbands and grandchildren made the founding gift for the museum's construction. The three generations pledged more than $3 million for the construction of a fine arts museum in 1983. At the time, it was the largest private gift ever given to the University of Florida. In 2000, the David A. Cofrin family made a gift to fund an 18,000-square-foot addition for contemporary art. The Mary Ann Harn Cofrin Pavilion, named in honor of the daughter of the late Samuel P. Harn, opened in October 2005. The Cofrin Pavilion features 6,500 feet of exhibition space and added both classroom spaces and the Camellia Court Cafe to the Harn Museum. 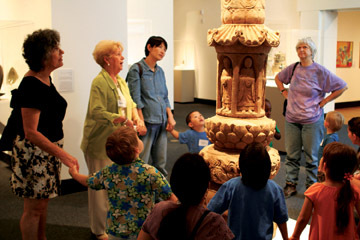 In 2012, the museum opened a 26,000-square-foot addition--The David A. Cofrin Asian Art Wing--dedicated to the exhibition, storage and conservation of the museum's extensive collection of Asian art.